Possums are furry animals about the size of a large cat. They are rarely seen during the day as they are nocturnal. Their prehensile tail and sharp claws enable them to easily climb trees which is their natural habitat. They eat enormous quantities of vegetation each night which creates a problem for the New Zealand native forests as the possums prefer to eat the young growth. There are some areas of forest that have been completely denuded of vegetation and have died as a result of possum activity. Why are Possums considered vermin? The possum is the biggest ecological threat in New Zealand. Having been introduced from Australia in 1837, the possum had no native predator and so has been controlled by the use of toxic chemicals. 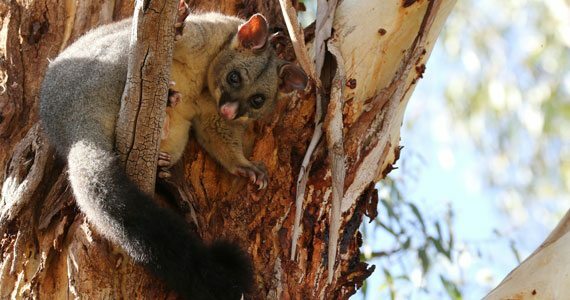 By using Brushtail possum fur, Untouched World™ is contributing to a reduction in the use of broadcast poisons and thus helping to protect native forest and birds. The New Zealand Government actively engages in programmes to cull possums and also supports the possum fur industry who trap the possum for use in possum merino knitwear. Native World is the first fashion company in the world to be recognised by the United Nations for sustainability. Will Possum Merino Wool Bobble? Under normal use the knitwear is low bobble. The possum fur, merino wool and silk fibres are all sourced so that the quality and size of the fibres are the same. In addition the possum fibre has scales so that, during the unique spinning process, the fibres lock together into a firm tight yarn which when knitted will not break down and form bobbles or pill. Where Does The Possum Fur Come From? Unfortunately in New Zealand there are 70 million possums at any one time, so because of the damage they do to the forest and bird life it is necessary to cull them and they are labelled as vermin. This is done by Government projects who also support the fur industry to gather possums. Only the finest wool from the animal is taken, which is mixed with belly wool from the merino lambs and silk to create possum merino blend. Is It True That Possum Socks Don't Smell? Well it certainly does seem to be. Last year our daughter wore her possum socks for two weeks without washing them and was delighted! The anti wicking nature of the possum merino blend removes the moisture and smell from the skin. However we do recommend that you wash your socks occasionally in warm water or put them in with the wool cycle. Will Moths Eat My Possum Knitwear? There is anecdotal evidence that moths do not eat possum knitwear and prefer the plainer lambswool knitwear. The factory is moth proofed twice a year so you can be sure that when the garment reaches you it will be free of moths eggs. Some people recommend the use of lavender bags or cedar wood. Can I Dry Clean My Possum Knitwear? Yes you can. It is worth noting that some of the chemicals in the dry cleaning process are quite harsh so long term would adversely affect the natural fibres of the possum merino knitwear. Is Possum Merino Knitwear Washable? Yes it is. The knitwear can be washed in a machine using a wool cycle and preferably using wool detergent. Please ensure that the water temperature does not exceed 30ºC. Some poorer quality washing machines have a severe tumbling action which is not recommended. Do not spin on a separate spin cycle. Alternatively they may be hand washed and dried on a towel in the shade.